Elias Ochoa and his therapy dog, Sam. 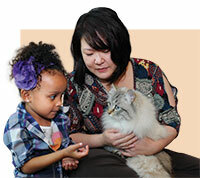 Dr. Judy Yang believes in the power of pets, especially when it comes to reaching out to an autistic child. While animal-assisted therapy is still a novel approach, there is increasing evidence that it can be helpful in specific conditions such as autism. To illustrate, Dr. Yang points to Sam the Poodle and his young master, Elias, as proof positive. It was a courageous decision, given that she and her husband, Joshua, had three other children, all younger than Elias, including Gianna who was only six-months old at the time. “We were raising two babies at once,” she chuckled. Sam, a black standard poodle, was the calmest, quietest dog from his litter and he and Elias hit it off from the start. Dr. Judy Yang with Tatiana Butler, 4, and Mr. Bingley.